It was 2011. I was turning 40 in June. 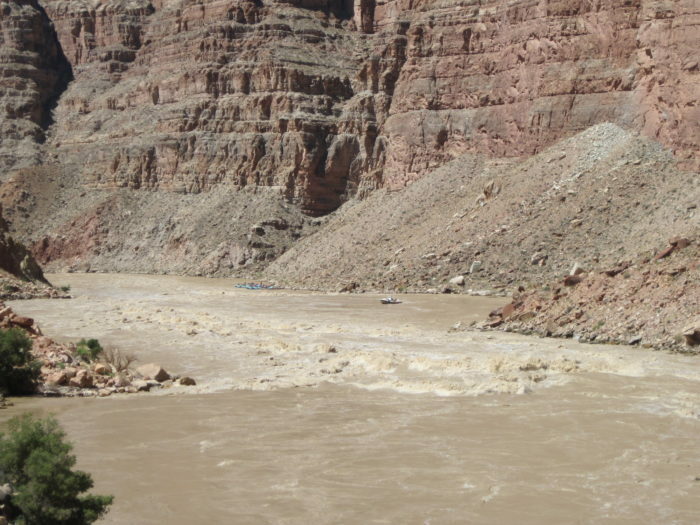 I wanted to do a river trip, so we chose Cataract Canyon with OARS. But, we decided to go in July, since the runoff would have tapered off by then. Well, that was a big winter year, and the runoff kept coming. It wasn’t easing off. No biggie. Six of us went with two guides on a 28-foot “snout” motorized rig. We launched outside of Moab, UT and the Colorado River was running around 30,000 to 40,000cfs. Our guides were adept at handling anything, and they made the trip enjoyable. We hiked, saw ruins, and came across a pink faded midget rattlesnake. We floated lazy sections in our life jackets, watching the red rock scenery drift by. We got to use a campsite called the “Honeymoon Suite,” one that can only be used at high water. It was a lovely view over the river. When we got to the confluence of the Colorado River and Green River, we had to pull over and have a safety talk. As we got off the boat, we all became aware of millions of large black spiders coating every branch of tree, shrub, and tamarisk in thick webs, just waiting for something to fly into their path. What ominous omen is this? We made sure to stay as far away from the sticky branches as possible. Suddenly, we were on a lot more water, as the added Green River runoff swelled the total to 60,000cfs. We had to put on helmets and prepare to hit some really big rapids. One rapid was so much fun, we did it nine times. Once we’d bounce and splash through it, our guides would motor us back up to do it again. We could have done that all day! When we got to the “Big Drops,” we found out that all private river traffic was closed–only the guided trips were allowed. And, National Park Service boats were stationed around the river to keep tabs on boats. One Park Service boat was floating at the bottom of the Big Drops, watching to make sure rafts made it through safely. We made it through on the far right, hugging the shore, white-knuckling the boat’s rigging. Wild muddy waves tossed us all around. Whew, safe! We were not able to go back upstream and run that one again–it would have been a wild ride! Toward the end of our trip, we did a fun hike in Dark Canyon, swimming through clear pools surrounded by gorgeous limestone. On our last day, we arrived at Hite Marina at Lake Powell. The water was so high, that the ramp at Hite was actually in the water, Lake Powell having suffered lowered water levels for the past decade. Back on land, a small plane came to pick us up at the Hite air strip. We flew back to Moab over Canyonlands and spectacular desert scenery, and powerful thermals that boosted the plane into the sky. How lucky we were to have such a bounty of water. Not many people were on the river that week, and it seemed we had the canyon to ourselves. What a treat!